We are a full service office supply and furniture dealer in the Espanola, Ontario area. 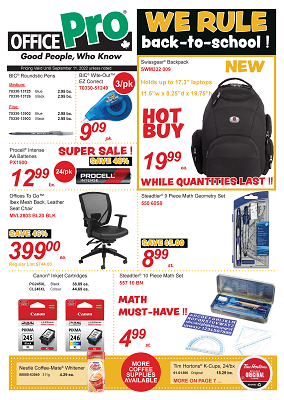 As a member of one of Canada’s largest independent office supply buying groups, we have access to thousands of office supply and computer supply items at competitive pricing. We also carry office furniture plus we do full colour copies. If you cannot find the item you are looking for, our knowledgeable staff will be pleased to assist you. As a locally owned and operated business, we understand the importance of dealing with suppliers who can offer us solutions - not just sell products. In our store we offer a wide variety of office supply products.